Back in the midst of the Norovirus scare that spread across the whole nation, we went ahead and planned an oyster dinner for some friends at home anyway. But during that winter of 2007 it appeared that raw oysters had simply disappeared completely from markets and restaurants because a health report from the government somewhat incorrectly claimed uncooked oysters as one the sources for the virus contamination. Even at Tsukiji market, where you can always find any kind of edibles from the ocean, and lots of them, I could not find oysters, or at least not much. All the retailers and wholesalers I spoke to shook their heads and said, “Nobody is buying oysters this winter”. Trying to buy different kinds of oysters for the dinner to make it an oyster tasting made my hunt even harder. 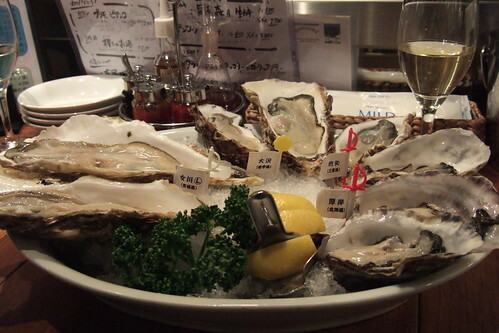 I wanted to serve several kinds of mollusks from various places in Japan and from overseas. Finally, I found a solution at this tiny but excellent oyster importer and wholesaler in Ota Shijo. 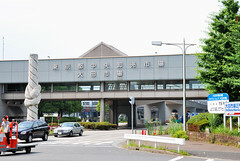 Ota Wholesale Market is located in Shinagawa, almost 30 minutes by bus from JR Shinagawa Station. It is such a low key giant market compared to their big brother on the same side of the bay, the Tsukiji Wholesale Market. You see no tourists anywhere and this modern market is built with much more space to accommodate anyone, even retail shoppers like me. Strolling around the market around 9 am felt like shopping at a local market compound with several shops in one location, except this place is just enormous. This modern market facility that looks like just a giant warehouse appeared almost as big as Tsukiji. They have huge vegetable and fruit sections and a good-sized seafood section. Every wholesaler I talked to at the market seemed to have more time to talk with retail shoppers. Simple questions turned into a long conversation when I bought beets, clams, and oysters. Please see my next post for more information about the oyster specialist, Yamaso at Ota Wholesale Market. How to get there: From JR Shinagawa Station Konanguchi side, catch bus #98 and go to Ota Shijo. The bus ride is about 25-30 minutes. Once you are at the wholesale market, you can go any of warehouse like giant vegetable, flower and fish wholesale sections. If you are hungry for seafood while you are at the market, there are several restaurants you can try. I am pretty sure there’s no line to get in! Menu examples from Fujiken: Seafood donburi, tuna donburi, unaju, etc. Menu examples from Daimatsu: Anago ten-don, tuna-ikura-uni donburi, beef cutlet teishoku, sashimi, anko nabe in the winter season etc. Seriously speaking we can find plenty at Parche in Shizuoka City! Thanks for your kind meesage, we are all alive and kicking! I just noticed: did you move to worpress.com/? Hi RG, I called my family and they were all fine. Then, I saw a picture how it was in Shizuoka. So, it got me worried. I am glad to hear you are all alive and kicking! We’ve been using wordpress and recently changed the theme. Hope you like it! Too bad for tuna auction ban, but I love going to Tsukiji after 9 am anyway. It’s a bit more relaxed, don’t you think? I like Ota Market because it is like visiting your local market, only it’s huge!